Many times I am being asked why the hell I decided to move to such a crazy and often times depressing place such as Palestine and Israel and to be honest I asked myself the same question numerous times. Obviously there are quite a few factors determining the answer, one of which is definitely food. And when I say food, I mean chickpeas. Ok, not only chickpeas, but to a great extent, yes. Chickpeas can be turned among other things into Falafel and of course into Hummus. Hummus means chickpeas in Arabic and refers to the very tasty, and by the way, extremely healthy dish most commonly prepared out of cooked and mashed chickpeas blended with tahini (a paste made out of sesame seeds), olive oil, lemon juice, salt and garlic. 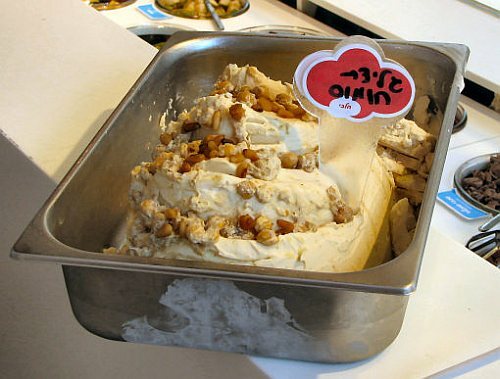 There are endless variations of Hummus, it is eaten by itself with pita bread, in combination with Foul (cooked and mashed fava beans), as a dip, a side dish and as I have recently learned even in the form of ice cream! 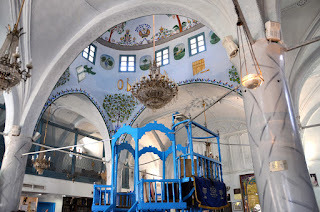 The exact origin of the dish is unknown, its first documented consumption dates back to the times of the crusaders, but some argue it was already mentioned in the Old Testament. Either way, Hummus is an integral part of both the Palestinian and the Israeli cuisine, but can be found all over the Levant and beyond. Both before and after the foundation of the state, Israel has made a big effort to distance itself from the local Palestinian culture, the exceptions being swear words (yes, Israelis adopted most of the Arabic curses and fitted them into the newly developing Hebrew language, which basically means, pronouncing them in a Hebrew way) and food, which was simply too delicious to be turned down. Falafel and Hummus were thus soon declared as the Israeli national dishes, which in turn angered most of the Arab states. 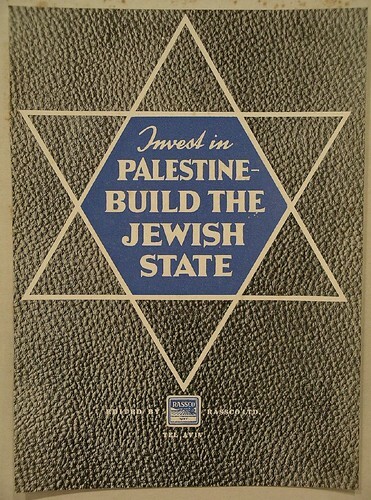 Lebanon in particular took this Israeli sentiment as a national offense and started what has now become known as the Hummus War. 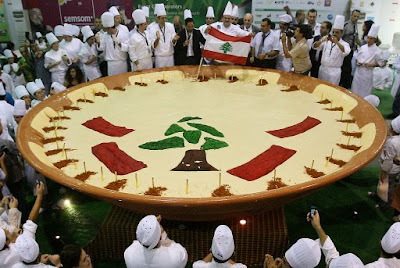 The war was first launched in 2008 by the Association of Lebanese Industrialists who claimed that Israel had “usurped several Lebanese and Oriental dishes” and thus petitioned the Lebanese Ministry of Economy and Trade to request protected status from the European Commission for Hummus as a uniquely Lebanese food. Until today the Association has not achieved its goal, but is reportedly still busy preparing documents and proof to support its claim. One victory was however captured in May 2010, when 300 Lebanese chefs mashed 10 tons of chickpeas and prepared 10,452 kilograms of Hummus, thus breaking the Guiness World Record set by 50 chefs from the Palestinian village of Abu Gosh, outside of Jerusalem, who had cooked 4,087 kilograms of the dish a few months earlier. Notwithstanding the fact that the chefs of Abu Gosh were Palestinian, the Guiness Record for Hummus being accorded to Israel (!) was simply too much to bear for the proud Lebanese. Another less verified political hummus tale says that in 2009, Syrian president Assad attempted to lure then Israeli Prime Minister Ehud Olmert into negotiations about an Israeli withdrawal from the Golan. The tale continues that, as a sign of trust, Olmert accepted the jar without even subjecting it to security checks. Yet, according to the Israeli newspaper Yediot Ahronot the hummus deal concealed the true intentions of both rulers: Assad sent Hummus, but secretly built a nuclear facility in northern Syria; Olmert ate the Hummus, but secretly gave instructions to attack the facility. The strike was carried out a short time after. 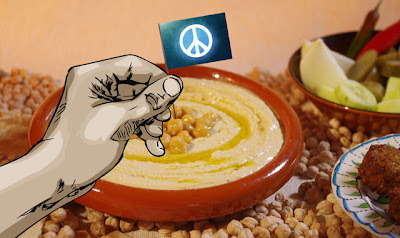 Many would probably argue that basically everything could serve as a battleground for the many conflicts in the Middle East, yet Hummus may also carry a great potential for establishing peace in the region, as the recent documentary by Australian filmmaker Trevor Grahm "Make Hummus Not War" suggests. Hummus by now constitutes an integral and beloved ingerdient of Levantine culture in general and, as the author of the unique Hummus blog Shooki Galili stated, claiming it "is like claiming for the rights to bread or wine. [...] Hummus is a centuries old Arab dish — nobody owns it, it belongs to the region". Great article. Not to mention, hummus is one of my favourite dishes in the world.